While looking for proof that it is raining in Cabo today (It was earlier) I found a webcam that shows our favorite beach. This is the Pacific Ocean beach that Solmar, Playa Grande and Hotel Finnesterra are on. The very "Land's End" of Baja California is the end of the rocks here. It is a great place for seeing whales in season and manta rays and flying fish in season. The beach drops very steeply, so swimming is not allowed. This shot is looking east from an area of huge mansions in a neighborhood called Pedregal. This is one of the areas the mega-bucks people have their third or fourth or fifth huge home. Villa Penasco Cam This is at a mansion for rent. Not in my price range! 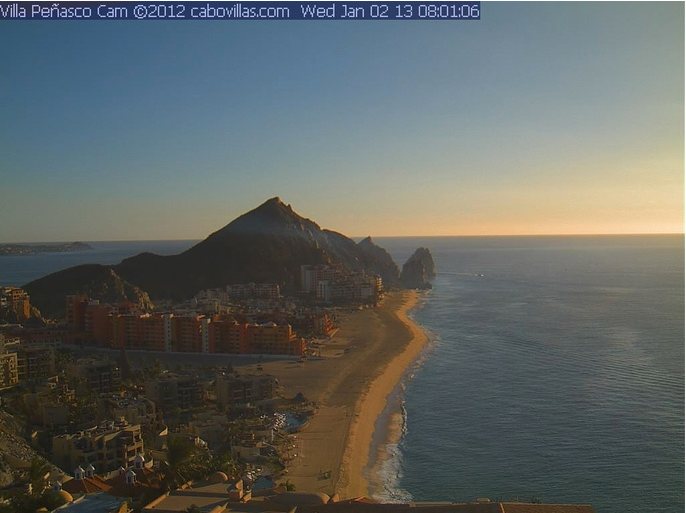 Its view includes a small part of the Cabo Marina's outside bay and shows a cruise ship today. Its clock is late by one hour (wrong time zone). Today it is not refreshing. And another - Villa Bellissima Cam. Today it is refreshing every 15 seconds. Photo: A screen capture just after sunrise I grabbed. Click to enlarge. The politicians are trying to escape responsibility for their lack of planning by blaming global warming. However Hurricane Sandy's super storm was rare but not unprecedented. The East Coast should prepare for more storms like it and even larger ones - in 1938 the "Long Island Express" was a category 3 hurricane. Example: Why did they allow placement of emergency generators in basements in areas known to be vulnerable to storm surges? Furthermore the current and past leaders have allowed development that makes the risk of storm damage worse. They have narrowed the Hudson River recently by 700 feet; the East River and other channels also. This narrowing causes storms waters to move faster and farther inland, rising higher and causing more damage. Nanny Bloomberg shares the blame, so he must be busy thinking up new distractions. 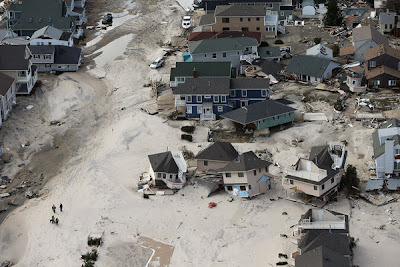 … If Sandy had been a category 3 hurricane like its 1938 ancestor, the devastation would have been of biblical proportions – as winds, waves and surges slammed into expensive homes, businesses and high-rises, and roared up waterways rendered progressively narrower by hundreds of construction projects. Lower Manhattan has doubled in width over the centuries. World Trade Center construction alone contributed 1.2 million cubic yards to build Battery Park City, narrowing the Hudson River by another 700 feet. The East River has likewise been hemmed in, while other water channels have been completely filled. Buildings, malls and raised roadways constructed on former potato fields, forests, grasslands and marshlands have further constricted passageways for storm surges and runoff. As a result, storms like Sandy or the Long Island Express send monstrous volumes of water up ever more confined corridors. With nowhere else to go, the surges rise higher, travel faster and pack more power. It’s elementary physics – which governors, mayors, planners and developers ignore at their peril. No wonder, Mayor Bloomberg, Governor Cuomo and other politicos prefer to talk about global warming, rising seas and worsening weather – to deflect attention and blame from decisions that have put more people in the path of greater danger. Indeed, the very notion of packing more and more people into “sustainable, energy-efficient” coastal cities in the NY-NJ area is itself madness on steroids. Worst of all, politicians are increasingly and intentionally obscuring and misrepresenting the nature, frequency and severity of storm, flood and surge risks, so that they can promote and permit more construction in high-risk areas, and secure more money and power. They insist that they can prevent or control climate change and sea level rise, by regulating CO2 emission – while they ignore real, known dangers that have arisen before and will arise again, exacerbated by their politicized decisions. As a result, unsuspecting business and home owners continue to buy, build and rebuild in areas that are increasingly at risk from hurricanes, northeasters and “perfect storms” of natural and political events. And as the population density increases in this NY-NJ area, the ability to evacuate people plummets, especially when roadways, tunnels and other escape routes are submerged. Let the buyer beware. Sandy may have been a rare (but hardly unprecedented) confluence of weather events. But the political decisions and blame avoidance are an all-too-common confluence of human tendencies – worsened by the dogged determination of our ruling classes to acquire greater power and control, coupled with steadily declining transparency, accountability and liability. The photo: Seaside, NJ. Getty images. Click to enlarge. Starbucks is directing its baristas in the DC area to write a political message on customers' cups this week - "Come together." Rather than be bystanders, we have an opportunity—and I believe a responsibility—to use our company’s scale for good by sending a respectful and optimistic message to our elected officials to come together and reach common ground on this important issue. This week through December 28, partners in our Washington D.C. area stores are writing “Come Together” on customers’ cups. That is a change of direction. Has Starbucks put its political position in front of customers before? Well… a few years back they printed cups with quotes that tended toward the squishy left, but did have some balance. Mickey Kaus says its creepy. “Room for smarm in your latte?” Isn’t there something creepy about Starbucks’ CEO Howard Schultz having [in Politico's words] “asked his Washington-area employees to write ‘Come Together’ on each customer cup today, tomorrow and Friday, as a gesture to urge leaders to resolve the fiscal cliff”? Did Schultz take a poll of his employees–sorry, “partners,” he calls them–before ordering pressuring asking them to join in this lobbying effort? What if he were, say, the CEO of Chick-fil-A and he “asked” his “partners” to write “Preserve the Family” on the outside of cups and containers? Merry Christmas to you. God sent Jesus to Earth 2,000 years ago to allow us to come to Him. 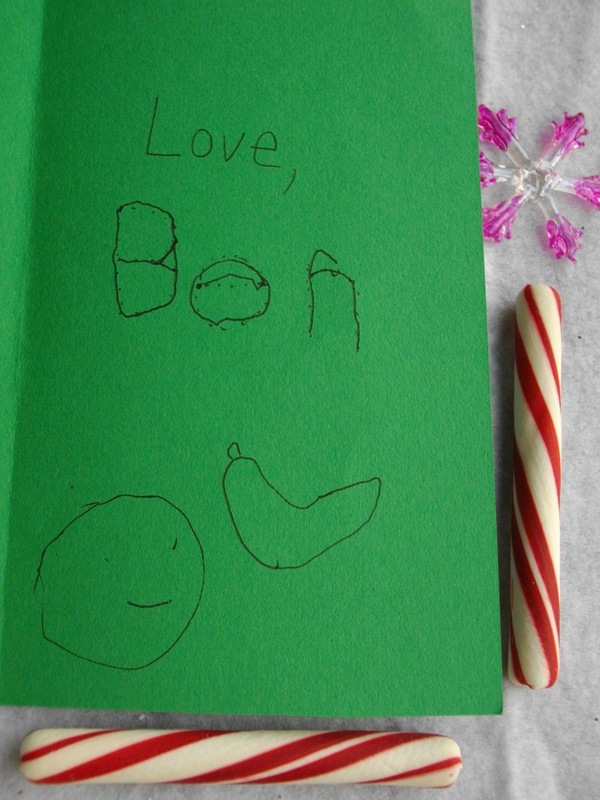 Art work: Christmas card handmade by Ben last year, then age 5. The greenies are all for renewable energy until someone invests their time and money and takes a risk on it. Then they fight tooth-and-nail against the actual project. They find every imaginable objection. While still taking up the green dream - somewhere else. In Port Townsend, WA, Port Townsend Paper wants to expand its existing biomass energy generation plant. The greenies fought and lost. But they have appealed and will continue to appeal and appeal. What do they want? The impossible, of course. To keep their lights on and drive their cars without any impact on the environment at all. The company says the expansion will power 46,000 electric cars. The place where they have sited the project is environmentally unsound, something that needs to be taken into consideration for any new project,” [Gretchen Brewer of PT Airwatchers] said. The biomass plant when constructed will provide an important source of alternative energy, mill officials said. “We will continue to evaluate the co-gen project and other measures we can take to reduce our dependence on oil and ways to continue our progress with reducing our greenhouse gas emissions,” the company said. We can start cutting spending by agreeing across the aisle that taxpayer money go only to those who need it - those with problems and low incomes - not those with high incomes. We agree, right? Wrong. First, the government-can-do-everything people see broader support for the policies of funding social programs if the payments are broader. Logical, though a very weak argument. But it goes much farther. The liberal establishment is so intent on getting more and more people dependent on the government that they resist the common-sense test that taxpayer money not go to those far above the poverty line. It's for Solidarity, "we are all in this together." So if we go to the same socialized health care clinics then we suffer together. (But ObamaCare doesn't put you and your Congressman with the same doctors.) If we all cash Social Security checks together…. Come on, get real. There is no common experience in seeing our automatically deposited checks arriving once a month. But it is part of their big picture. Everyone dependent. The British placed Napoleon on St.Helena Island because it was so remote he could never escape; he died there. It is in the South Atlantic Ocean 800 miles from anything (the remote Ascension Islands) and almost twice as far from Angola on the mainland of Africa. A huge change is coming with an airport being carved from the rock - to open in 2015 or 16. 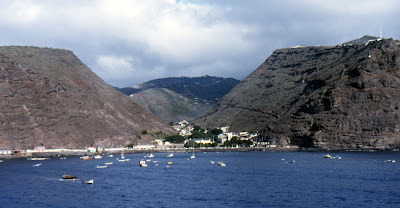 Photo: Jamestown, capital of St. Helena Island. From Wikimedia. Click to enlarge. A Massachusetts state representative has agreed to plead guilty to civil rights violations and resign from office for his role in submitting false absentee ballot applications and casting invalid ballots in 2009 and 2010, the Justice Department said in a news release Thursday. The nations in Africa are behind, but they are growing their economies. And getting into space is getting much cheaper. Nigeria has two satellites in orbit to survey farm land. Ghana is converting a communications dish to a radio telescope. Uganda is aiming to orbit a camera. But, you say, it's much cheaper to get images using Google Earth! And, of course, a nation can contract for images from the same sources Google uses. True, but it is very inspiring. In Uganda the director of its $45 million program Chris Nsamaba says "We're building this ourselves; we've never consulted anybody." (I would consult others.) He continued "In Uganda… we teach ourselves how to do something." Self sufficiency is very healthy, but you learn from others…. … If all goes well, South Africa will convert idle antennas in Kenya, Zambia, and Madagascar into a continentwide network of telescopes. That would be a prelude for the Square Kilometer Array—a $1.87 billion telescope nest, the world's biggest, based in South Africa. Come 2025, South Africa would like to build at least one other, much more sophisticated telescope up in Ghana's north for the array. Scientists at that facility would track radiation hinting at how the universe began, says Ms. Loots, who is an associate director for the Square Kilometer Array. The US first led the world in per capita income around 1830. But Europe didn't realize they were behind until 1904. The US is still the largest by 2 to one over China. Why? It started with shortage of labor which caused high pay and the need for high productivity which caused a wave of creativity in business processes. The result - lower prices. And prosperity!! There is more to it. I have to study this more. A man nicknamed Admiral so enjoyed the rush of a day of sailing in the San Juan Islands he decided to jump his car. Onto the beach in Port Townsend, Washington December 8, 2012. He said he didn't feel drunk. No Darwin award; he had only minor injuries. You have to die young to earn a Darwin award. Herschel Hardin goes into detail about the need to treat those with the greatest needs, rather than spread the tax dollars over feel-good programs. The public is growing increasingly confused by how we treat the mentally ill. More and more, the mentally ill are showing up in the streets, badly in need of help. Incidents of illness-driven violence are being reported regularly, incidents which common sense tells us could easily be avoided. And this is just the visible tip of the greater tragedy - of many more sufferers deteriorating in the shadows and often, committing suicide. People asked in perplexed astonishment: " Why don't we provide the treatment, when the need is so obvious?" Yet every such cry of anguish is met with the rejoinder that unrequested intervention is an infringement of civil liberties. This stops everything. The most chronic and disabling of the major mental illnesses, schizophrenia involves a chemical imbalance in the brain, alleviated in most cases by medication. Symptoms can include confusion; inability to concentrate, to think abstractly, or to plan; thought disorder to the point of raving babble; delusions and hallucinations; and variations such as paranoia. Untreated, the disease is ravaging. Its victims cannot work or care for themselves. They may think they are other people - usually historical or cultural characters such as Jesus Christ or John Lennon - or otherwise lose their sense of identity. They find it hard or impossible to live with others, and they may become hostile and threatening. They can end up living in the most degraded, shocking circumstances, voiding in their own clothes, living in rooms overrun by rodents - or in the streets. They often deteriorate physically, losing weight and suffering corresponding malnutrition, rotting teeth and skin sores. They become particularly vulnerable to injury and abuse. Tormented by voices, or in the grip of paranoia, they may commit suicide or violence upon others. Read the whole thing. It's not real long. Bloomberg New partisan? They commissioned a poll, then only showed the side they liked. A poll conducted last week by an Iowa-based firm showed Americans are conflicted about whether or not to support raising tax rates on wealthy Americans to avert the so-called “fiscal cliff.” But that’s not how Bloomberg News, which commissioned the poll, reported the results Thursday. In a story headlined “Americans Back Obama Tax-Rate Boost Tied to Entitlements,” Bloomberg emphasized only that the poll showed most Americans support President Barack Obama’s insistence on increasing taxes for high-income earners. “A majority of Americans say President Barack Obama is right to demand that tax-rate increases for the highest earners be a precondition for a budget deal that cuts U.S. entitlement programs,” the story, written by reporter Julie Hirschfeld Davis, began. Fifty-two percent responded that they preferred limited tax breaks to a tax-rate hike. Only 39 percent said they would rather see tax rates on the wealthy increase. Nine percent indicated they weren’t sure. Danny Westneat noticed the obvious. The bipartisan coalition formed in the Washington Senate is about money. They can't spend a billion more than is coming in. Tim Eyman beat them again with an initiative requiring a super-majority or vote of the people to raise taxes. And won in all 39 counties. Grrrrr. I am not putting this on Sound Politics because we are in Cabo SL Mexico w poor service. A bipartisan coalition got control of the Washington Senate. For one purpose. A responsible budget. More in sorrow than anger. The establishment Wash Post discovers that Obama has not lived up to his promise to be "the most-open administration ever." Indeed, He is far, far from His promises. Obama promised to get FEMA and other parts of his administration to cut red tape and be quick in responding to victims of Hurricane Sandy. But He didn't. Hillary Clinton has an explanation. That was a campaign promise. During campaigns sometimes we over do things. - As I recall her response to a student in another country. AP/CBS/ABC/NBC might want to ask Him why he didn't do what he promised. Storm-ravaged New Yorkers say President Obama’s promise to cut red tape and get them aid in the aftermath of Sandy has proven to be hot air. … Obama addressed the nation from FEMA headquarters in Washington on Nov. 3, promising to cut red tape and bring the full force of FEMA to hard-hit residents. "What I told the governors and the mayors is what I've been saying to my team since the start of this event, and that is we don't have any patience for bureaucracy, we don't have any patience for red tape, and we want to make sure that we are figuring out a way to get to yes, as opposed to no, when it comes to these problems," Obama said. On Nov. 15, Obama came to Staten Island, where he repeated his pledge.